This might be my most anticipated novel of the year, people. It's hard to say for certain, what with Sinner having just come out (more on that soon) and Isla and the Happily Ever After hitting shelves in August (the day before my birthday, but who's counting). And then there's the annual Briggs and Andrews to look forward to. But Landline? Yeah, I think it was the one. I started it just as fast as was humanly possible after it arrived in the mail, and then I held it for long minutes after finishing, just . . . not wanting to be physically separated from it yet. I've even had difficulty letting it out of the house since. But then I'm the same way with my copies of Fangirl and Eleanor & Park. I want everyone in the world to read them, but I get just a bit twitchy while they're gone. Rainbow Rowell's books tend to hit me where I live, whether that's the me that rode the bus tense and lonely in high school, the one that fell in love unexpectedly and hard in college, or the one that has three kids, a job, and a husband that everything rests on. So it made sense that I went in eagerly and with not a little fear that I would be a bit destroyed by the whole thing. "This might be our shot," Georgie said. "Our own show." Neal nodded without lifting his head. "Right," he said. His voice was soft and flat. Sometimes she lost her place when she was arguing with Neal. The argument would shift into something else—into somewhere more dangerous—and Georgie wouldn't even realize it. Sometimes Neal would end the conversation or abandon it while she was still making her point, and she'd just go on arguing long after he'd checked out. Georgie McCool (best name ever) has been waiting years for her big break. Along with her best friend and writing partner Seth, she's scraped her way into television with a sitcom they both pretty much hate but that has proven wildly popular. And every second she's not working on it, she's working on their real show. The one they love, the one that will make it just as soon as someone decides to invest the money. When she's not eating and breathing work, she's at home with her husband Neal. Neal. The one who has supported her through everything, who's raised their two little girls, who she fell in love with in college. Now, on the brink of Christmas, it seems as though they finally have someone interested in funding the show. Trouble is, they have to work through the holiday to do it, and she was meant to be going back to Omaha with Neal and the girls to spend Christmas with his mom. As straws that break the camel's back go, this one's fat and juice and possibly the one. Neal tells her to go. That of course it's important. That they'll see her after Christmas. But something inside Georgie knows, this separation might be the end. But when she goes to her mom's house the night after Neal and girls have flown to Omaha, after trying and failing to reach him on his cell, she picks up her old landline phone in her old bedroom and she calls Neal. But the Neal that answers isn't her Neal. Or at least, he isn't her Neal today. Somehow, inexplicably, he's the Neal of their college days. The Neal she fell in love with. The one who doesn't know yet where their life will take them. And so with Neal from the past on the line and Neal from the present out of reach, Georgie must decide what she wants. And if she would change it all if she could. I don't know. Rainbow Rowell's novels fill my eyes with tears. Whether they're tears of mirth, sympathy, or pain (likely all three at once), my eyes are glassy from start to finish. But they were, perhaps, closest to spilling over with Landline. Rowell has the uncanny ability to capture the essence of a time period, of being a certain age in that time period, of being in love at that age in that time, and the exhausting and joyful task it is containing and parsing out the accompanying emotions. And in Landline she does that with multiple timelines at once. We first meet Georgie and Neal as they are standing at the edge of a precipice. Their emotions are taut and eerily quiet. It's agonizing for the characters and reader alike. And if the reader were only ever given the present day timeline, it might have been too much. But the landline to the past (and the attendant glimpses we get of Georgie and Neal as they were falling in love) saves the whole thing. In perfect increments, and without disrupting any of the flow, these conversations and memories allow the reader inside—into the full picture of a long term relationship. It's inexpressibly riveting. The trademark Rowell humor is present, but muted somewhat, echoing the ways in which Georgie and Neal's relationship has become overshadowed by time, experience, parenthood, life. It all cut so close to the bone, that at times I had to look up from the page and remind myself to breathe and not allow too many of my vital functions to hinge on the outcome of this story. Because I was breathlessly worried. As with her other books, I marvel at the way I find myself approaching the end with a fuller comprehension than is my wont of how fitting a number of different outcomes would be. Even the ones I fear. Perhaps those ones most of all. Yet I am always at peace with the one she chooses. Each timeline is given appropriate attention in the end, and there is one small moment leading up to the close that is perfect in every way, in which every narrative thread coalesced for me. My, how I read this book. Neal licked his bottom lip and nodded. "I think . . ." The closer she was, the more he looked away. "I think I just want you," he said. Neal looked surprised—he almost laughed. "Okay?" She nodded, close enough to bump her nose up against his. "Okay. You can have me." He pushed his forehead into hers, pulling his chin and mouth back. "Just like that." She reached her mouth toward his, and he twisted his head up and away, looking at her. He was breathing hard through his nose. He was still holding her cheek. Really. You can have me. Because I'm good at wanting things and good at getting what I want, and I can't think of anything I want more than you. Really, really, really. Neal nodded. Like he'd just been given an order. Then he let go of Georgie's hand and pushed her (pinned her) gently (firmly) back into the sand. He leaned over her, his hands on either side of her shoulders, and shook his head. "Georgie," he said. Then he kissed her. That was when she added Neal to the list of things she wanted and needed and was bound to have someday. That's when she decided that Neal was the person who was going to drive on those overnight road trips. And Neal was the one who was going to sit next to her at the Emmys. 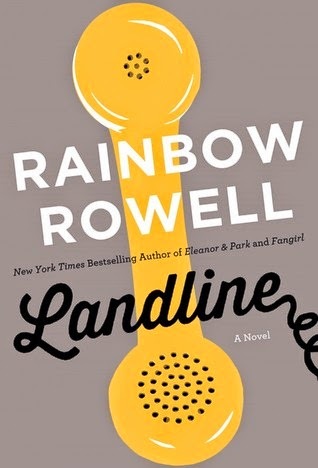 Landline is due out July 8th. Landline really was such a beautiful book. It was very uncomfortable, at the beginning, how quiet Neal and Georgie were. This is such, such, SUCH a wonderful review. There's a part of me that wants to wait ten years to read this because the "You don't know when youA're twenty-three" really strikes me. But heck, it's Rainbow Rowell so that's definitely not happening. This is such a fabulous review, Angie, because even if I'm struggling with listening to Landline now myself I still find myself thinking YES to all of your statements. It's amazing how she can capture so many different types of love and life. I think that if I reread this book in like ten years when I've been married for a while and had kids I'll GET IT a heck of a lot better than it gets me at the moment. But yes, the flashbacks to college are what's keeping me afloat. I accidentally hit 'skip' during one of their phone conversations yesterday and found myself desperately frozen on the spot rewinding to find the spot where I'd missed. Angie, I love how beautifully you review the books that you love. I'm already excited for Landline but even more so, now that I know how well it worked for you. I've seen it in bookstores here but I would rather have the ebook since it's easier for me to read on my Kindle and I don't have to worry about shelf space. Oh my yes. That first scene where they're talking in the kitchen . . . I knew right then I was in for a world of hurt. The good kind. But still. But I know what you mean. That part continues to strike me daily. Guh. I would pay to have you reread it in ten, Heidi, and then sit down and tell me all your thoughts. The flashbacks are so key. I would have been bogged down without them. I needed college Neal. And those conversations to Omaha. Sigh. :) Love it, I did. I'm glad it's over there! Fortunately, the ebook is not far off. Let me know what you think, Chachic!